Local Mortgage Banking Since 1983. Family Owned and operated mortgage banking companies are extremely rare. Although we operate in a complicated and extremely regulated industry, our goal is to make our customers feel at ease and understand their transactions. Providing honest and knowledgeable guidance to our customers has always been paramount. We know that many things in our industry cannot be controlled. Regulations, housing markets and interest rate environments are constantly changing. One thing we can ensure, however, is that you’re treated with respect and honesty. We have a tremendous staff with decades of experience to help and we are proud to support the communities which we lend in. Like you, we have a vested interest in our area’s success and nothing makes us happier than seeing our customers succeed. We will continue to do business the right way and give back to the communities that have given our family so much. 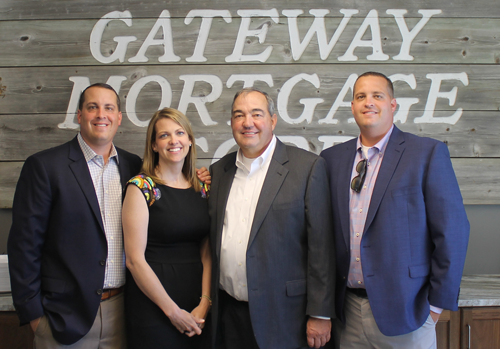 The leadership for Gateway Mortgage Corporation features (from left to right): Kyle C. Deaton (Vice President), Jenna L. Pitts (Vice President), W. Craig Deaton (President) and Kevin J. Deaton (Vice President).